This Hike is led by GWHSD Ambassador Sierra Jean Vickers. I tend to be a faster-paced hiker, and this is also a long hike! So please consider your fitness level before signing up for this hike. I am happy to take breaks, but don't want to wait around a lot. I am training for the Trailblaze Challenge, so I'm trying to challenge myself, while I lead hikes, and I would love to have you come along to challenge yourself too! Trail Rating: YELLOW: Moderate hike, well-signed, elevation gain of between 1,000-2,000ft., low altitude. Novice hikers welcome! 3L of water required. PLEASE consider that this is a 16.6 mile hike, with over 2,000 ft. elevation again. It is on the cusp of a YELLOW/RED hike! Trail Rating: YELLOW: Moderate hike, well-signed, elevation gain of between 1,000-2,000ft., low altitude. Novice hikers welcome! This Hike is led by GWH Ambassador Sierra Jean Vickers! Also, please wear pants on this hike. My first time hiking this trail, I wore shorts and my legs got super scratched by low-lying bushes. It wouldn’t hurt to bring some extra layers too, because it can be windy and cold near the summit. Trail Rating: YELLOW: Moderate hike, well-signed, elevation gain of between 1,000-2,000ft., low altitude. Novice hikers welcome! 3L of water required. Please be advised that AllTrails has this hike marked “Hard,” so if you are a complete beginner, I would do some training beforehand. Dogs: Yes, must be kept on leash, and please, only very athletic, fit dogs! Bring extra water for your dog!!! This series led by GWH Ambassador Amanda Cash! I hope to maintain a hiking pace of at least 2 mph (30 min/mi). As the temperature, mileage, elevations and altitudes increase on each hike, 2 mph will become harder to maintain, and this is where the additional cardio training will come in handy. This Hike is led by GWH Ambassador Kate Murphy and is hike#1 of the Trail Treks Beginners Series! I will not be handing out punch cards at this event. They’re available through purchase of a New Member Kit only. If you purchased a new member kit, the punch card was sent with your welcome email. This Hike is led by GWH Ambassador Jess LaScola! This Hike is led by GWH Ambassador Caitlin Granade! 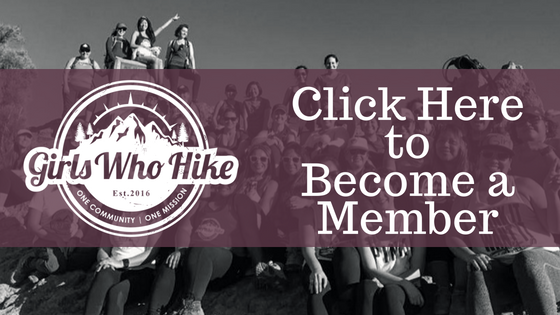 This Hike is led by GWH Ambassador Caitlin (Cait) Granade! The Mission trails parking lot where Father Junipero Serra Trail crosses Bushy Hill Dr.
*This is a GWH members only hike, no guys, kids or pets for this one. TIME: Meet at 6:15am, hike starts promptly at 6:30am. There is no service at the trailhead so please be on time. PACE: Looking to keep about a 2mph pace but WILL be staying (hiking, summiting and ending) as a group. If you’re on a tight time crunch or aren’t looking to stay as a group, it may not be the hike for you. ❗️Required: 4L water, snacks, first aid kit, layers (weather dependent), trail map (digital or physical) and sunscreen. Recommended: electrolytes, trekking poles, bug spray or bug net, and a buff or bandana. GWH RATING- RED: Strenuous hike,possible unmarked trail, elevation gain of 2,500+, altitude up to 9,500ft. Experienced hikers welcome, semi-experienced welcome if they plan on training beforehand! 4L of water required. BLACK: Experienced hikers ONLY, unmarked trail/easy to get lost, 9,500ft.+ altitude, 3,000+ft. elevation gain. At least 5L of water required. Trail Rating: Green/Yellow - 918ft elevation gain and close to 6 miles and total elevation at 2000 ft. The heat will add to the day, but overall a very enjoyable hike. This Hike is led by GWH Ambassador Joy Morrison! Permits / Passes: Free Eventbrite ticket required. This is an official monthly meetup led by GWHSD Ambassadors Kaitlyn Chermak and Dulce Natalie. You must have a free Eventbrite ticket to attend (available starting 3/1/18 @ 8pm). All attendees must register via eventbrite and sign (or have already signed) the GWH waiver. Join the San Diego chapter for their monthly meetup! Hosted by GWH Ambassador Erika. Join the San Diego chapter for their monthly meetup! Hosted by GWH Ambassadors Kaitlyn & Natalie. Note: This is a Sunset/Full Moon hike!